Convert any DRM protected music files (such as M4P, M4A, M4B) and unprotected music (such as WMA, MP3, rax, MP4, WAV, RA, snd, AAC, OGG, AA, aif) to plain MP3 formats. 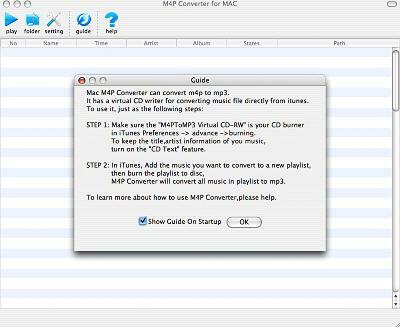 MAC M4P Converter is an audio and music files M4P to MP3 converter. It converts any DRM protected music files (such as M4P, M4A, M4B) and unprotected music (such as WMA, MP3, rax, MP4, WAV, RA, snd, AAC, OGG, AA, aif) to plain MP3 formats. Then you can share these converted files on any computers or music devices. MAC M4P Converter uses a virtual CD burning technology to simulate the burning and ripping/encoding process automatically. With MAC M4P Converter, you can easily convert protected audio and music files to plain MP3 formats. It does not crack DRM control. It bypass DRM control with a virtual CD-RW drive. Fully automatic, MAC M4P Converter frees you from the hassles of copy protection without defeating the DRM copy-protection technology used by your audio files. This means it will function with all copy-protection measures, and it's completely legal. Note: If you want to find M4P converter for Windows, please use Protected Music Converter. MAC M4P converter converts any DRM protected music files (such as M4P, M4A, M4B) and unprotected music (such as WMA, MP3, rax, MP4, WAV, RA, snd, AAC, OGG, AA, aif) to plain MP3 formats. Xilisoft DVD to iPhone Suite for Mac - Convert DVD, AVI, MPEG, WMV, MOV, MP4, VOB, AAC, AC3, MP3 etc to iPhone, iPod video and audio formats MP4, MP3, M4A.